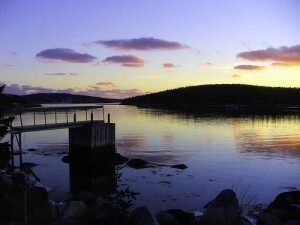 A December sunset in Shad Bay. December is when winter really starts to make itself felt in Nova Scotia. Bring a good pair of gloves, a scarf and a hat. Daily highs barely edge above freezing and nights are frigid. On the upside, the cold weather does create some beautiful landscapes – a dream for photographers. Skiiers will enjoy trying out the first snow of the season at resorts like Ski Wentworth. The runs are usually ready to go by the middle of the month but if there’s no powder you can try skating at one of dozens of community rinks. With Christmas approaching, many communities will hold festivals, like the Father Christmas Festival in Mahone Bay. Everything shuts down on Christmas Day, December 25. Airplanes, trains and buses get busy a few days before Christmas as people travel to be with their families. Book any transport well in advance and remember that a surprise snowstorm can cause severe disruption. Boxing Day is the day after Christmas, December 26. It’s not officially a holiday but many stores stay closed. When things do re-open, it’s a dream for bargain hunters, with big sales to clear out Christmas merchandise.